Everyone knows the New Testament begins with the Gospel of Matthew, but how many know Matthew was actually one of the later books to be written? (It wasn't even the first Gospel!) But Evolution of the Word is not your typical New Testament. Marcus J. Borg, esteemed Bible scholar and bestselling author, shakes up the order of the New Testament as we know it by putting the books in a completely new order-the order in which they were written. By doing so, Evolution of the Word allows us to read these documents in their historical context. For the first time, see how the core ideas of Christianity took shape and developed over time. Borg surveys what we know of the Jewish community of Jesus followers who passed on their stories orally. Into this context emerges the apostle Paul, whose seven authentic letters become the first collected writings that would later become the New Testament. Borg offers helpful introductions for each book so that as we read through these biblical documents, spanning over a century in time, we see afresh what concerns and pressures shaped this movement as it evolved into a new religion. In this groundbreaking format, Borg reveals how a radical and primitive apocalyptic Jewish faith slowly became more comfortable with the world, less Jewish, and more pre- occupied with maintaining power and control. Evolution of the Word promises to change forever how we think about this historic work. 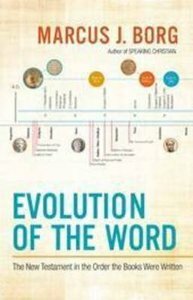 About "Evolution of the Word"